Single-locus analysis is often used to analyze genome-wide association (GWA) data, but such analysis is subject to severe multiple comparisons adjustment. Multivariate logistic regression is proposed to fit a multi-locus model for case-control data. However, when the sample size is much smaller than the number of single-nucleotide polymorphisms (SNPs) or when correlation among SNPs is high, traditional multivariate logistic regression breaks down. To accommodate the scale of data from a GWA while controlling for collinearity and overfitting in a high dimensional predictor space, we propose a variable selection procedure using Bayesian logistic regression. We explored a connection between Bayesian regression with certain priors and L1 and L2 penalized logistic regression. After analyzing large number of SNPs simultaneously in a Bayesian regression, we selected important SNPs for further consideration. With much fewer SNPs of interest, problems of multiple comparisons and collinearity are less severe. We conducted simulation studies to examine probability of correctly selecting disease contributing SNPs and applied developed methods to analyze Genetic Analysis Workshop 16 North American Rheumatoid Arthritis Consortium data. 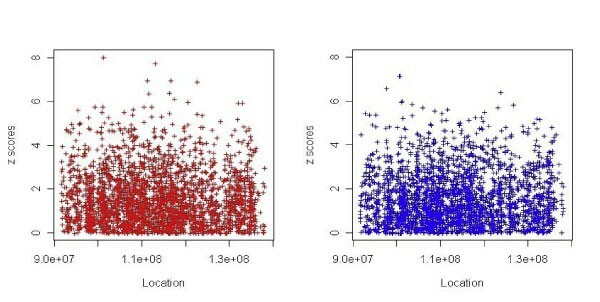 Single-locus analysis is a widely used approach to analyze genome-wide association (GWA) data, but it may not be adequate to capture complex pattern of disease etiology  and is subject to severe multiple comparisons adjustment, especially in a GWA, in which the typical number of comparisons made is hundreds of thousands. Methods to handle large number of single-nucleotide polymorphisms (SNPs) simultaneously are in demand. Logistic regression is a popular tool to assess association between a dichotomous trait and SNP genotypes. To analyze multiple SNPs simultaneously by logistic regression, one can include all SNPs of interest as predictors. A challenge of applying such approaches to GWA data is that the sample size is usually much smaller than the number of SNPs. Traditional multivariate logistic regression breaks down in this case. Another disadvantage of such an approach is that when the correlation between SNPs is high due to linkage disequilibrium (LD), the estimated coefficients are highly variable and the method performs poorly. To accommodate large number of SNPs from a GWA while controlling for collinearity and overfitting in a high dimensional predictor space, we propose a variable selection procedure using Bayesian logistic regression. We explored a connection between certain priors and penalized logistic regression. After analysing large number of SNPs simultaneously in a Bayesian logistic regression, we selected important SNPs for further consideration. With much fewer selected SNPs of interest, problems of multiple comparisons and collinearity are less severe. We conducted simulation studies to examine the probability of correctly selecting disease contributing SNPs. Finally, we applied the methods to analyze Genetic Analysis Workshop (GAW) 16 Problem 1 chromosome 9 data. Maximum likelihood is used to estimate parameters in the model. When the number of predictors exceeds the sample size, traditional logistic regression breaks down. In addition, when the predictors are high correlated, the maximum likehood estimate from Eq. (1) is of poor quality. where l is the log likelihood of the data. Choosing prior variances σ2 is equivalent to choosing smoothing parameter λ. This is also the ridge regression. While L2 penalized regression shrinks coefficients towards zero, it does not favor them to be exactly zero. In contrast, L1 penalized regression provides sparse solutions when a large number of coefficients will be zero. Here we assume the prior parameter τj to take the common value τ. This is also the LASSO regression. Choosing prior variance of the parameters in a Bayesian regression, or equivalently, the regularization parameter in a penalized regression, is important for variable selection. A small prior variance provides more shrinkage towards zero or favors more coefficients to be zero. A large prior variance reflects more uncertainty of the prior information. The prior variance was chosen by 10-fold cross validation. The sample was split randomly into 10 parts. The model was fit on 9 out of the 10 parts and the log likelihood function was computed using the remaining one part of the data. This procedure was done for each of the 10 parts and the average log likelihood was calculated. The prior variance was chosen as the one that maximizes the "cross-validated" average log likelihood. We performed simulation studies to examine the effectiveness of Bayesian logistic regression as a variable selection procedure. We simulated 100 dichotomous predictors from a Bernoulli distribution. The probability of the predictor being one is generated from a uniform distribution, U(0.25, 0.45). Ten of the hundred predictors jointly determine a subject's disease status. The remaining 90 predictors are not used in simulating subjects' disease status. We simulated two settings of sample sizes (n = 150 and n = 250) and two settings of odds ratios. The odds ratios are simulated from a uniform distribution, U(1.5, 2), or U(2, 2.5). We fit Bayesian logistic regression with Gaussian and Laplace priors using software BBRBMR . BBRBMR can fit large-scale regressions with tens of thousands of predictors in a timely fashion. The algorithms used find posterior mode of a logistic likelihood efficiently . We chose the prior variances by 10-fold cross validation. The logistic regression with Gaussian prior does not do variable selection directly. After performing the Bayesian analysis of all SNPs together, we selected SNPs for the second stage analysis by ranking their estimated regression coefficients from the first stage simultaneous SNP analysis. We simulated 30 sets of data under each of the four combinations of sample size and odds ratio. The effectiveness of proposed methods is evaluated by 1) the average number of disease-contributing predictors selected (out of the ten); and 2) how consistent each of the ten predictors is selected. The consistency is defined as the average percent times of each disease-contributing variable being selected across simulation data sets. All analyses were performed on the GAW16 Problem 1 North American Rheumatoid Arthritis Consortium (NARAC) data. We analyzed 2705 SNPs on chromosome 9, ranging from 91,730,970 kb to 138,303,776 kb with minor allele frequency greater than 0.01 and no missing genotypes. This area covers the location where the most significant SNP (rs3761847) was reported by Plenge et al. . We checked all 2705 SNPs for Hardy-Weinberg equilibrium (HWE) in the controls using PLINK  and did not find any SNP significantly violate HWE assumption after using the Bonferroni adjustment for multiple comparisons. The SNPs were coded in two ways: dominant and additive. We divided the sample into a discovering sample (N = 1031) and a replication sample (N = 1031). First, we fit Bayesian logistic regression with a Gaussian prior using BBRBMR software on the training sample. We bootstrapped 100 times to provide standard error of the estimated coefficients. Second, we selected the top 300 SNPs according to two criteria: 1) the absolute value of the coefficients, and 2) the ratio of the coefficients to their bootstrapped standard errors (z scores). Selecting variables based on the absolute value of the coefficients instead of z scores may provide more reproducible results . Especially for the SNPs with large signals and large variability, the z score may be low, but the coefficient may be large. We compare results using these two selection criteria. Third, we conducted chi-square tests on the 300 selected top-ranking SNPs using the independent testing sample. We analyzed data under both a dominant and additive model. For the Gaussian prior with sample size 250 and high odds ratio (odds ratio ranging from 2 to 2.5), the average number of correctly identified SNPs in the top 20 SNPs selected by the magnitude of the regression coefficients is 8.3 (out of the 10 disease-associated SNPs). For the same prior and the sample size but with moderate odds ratio (odds ratio ranging from 1.5 to 2), the average number of correctly identified SNPs is 6.7. When decreasing the sample size to 150, in the high and moderate odds ratio model, the average number of correctly identified SNPs is 7.4 and 6.4, respectively. The consistencies (the average percent times of each disease-contributing variable being selected across simulation data sets) in the above four settings ranges from 0.73 to 0.97, 0.53 to 0.77, 0.6 to 0.87, and 0.57 to 0.73. For the Laplace prior, the average numbers of SNPs correctly identified in each of the four settings were: 6.7, 4.5, 4.2, and 4.0, respectively. The consistencies were lower than the Gaussian prior. For the Bayesian logistic regression with 2705 SNPs, the number of iteration in the Markov-Chain Monte Carlo calculation was 250 for the additive model and 187 for the dominance model. Convergence was reached with threshold 0.005. For the dominant model, the highest z score was 7.16 (rs7864653 at 100,860,678 kb). For the additive model, the highest z score was 8.02 (rs1407869 at 101,353,456 kb). Figure 1 displays the z scores for all 2705 SNPs. Table 1 shows numerical results of the highest ranked SNPs. Several top-ranked SNPs lie in the region where the most significant SNP was reported by Plenge et al. (rs3761847 at 120,769,793 kb): for example, rs2900180 at 120,785,936 kb and rs1953216 at 120,720,054 kb. p- Values for 2705 SNPs in the Bayesian logistic regression (Gaussian prior): additive model (left panel) and dominant model (right panel). We selected the top 300 SNPs and performed single-SNP analysis using the independent testing set of 1031 subjects. LD plot revealed that the selected SNPs had lower intermarker LD than the total marker map (not shown). Table 2 summarizes the top 10 SNPs with the lowest p-values in each model. The top three SNPs in the additive model were in the region reported by Plenge et al. . Instead of selecting by z scores, we also selected the top 300 SNPs by the absolute value of the regression coefficients. For the additive model, selecting by absolute value of β or by z score provided the same ranking for the top 14 SNPs. For the dominant model, there were 10 overlapping SNPs for the two selection criteria among the top 15 SNPs. Figure 2 depicts the p-values of the SNPs selected by the two criteria: circles for the z score method and crosses for β-based method. The two criteria selected similar sets of SNPs. p- Values of the top 300 SNPs selected by β or z scores (single-SNP analysis): additive model (left panel) and dominant model (right panel). We propose a Bayesian logistic regression procedure to select important SNPs based on the z scores or the regression coefficient estimates for further analysis. From the simulation studies, when using a Gaussian prior, the percentage of causal SNPs correctly selected ranges from 64% to 83% among the top 20% SNPs. For the Laplace prior, the percentage of correctly identified causal SNPs ranges from 40% to 67%. The Gaussian prior outperforms Laplace prior, which could be attributable to a less stringent feature selection criterion employed for the Gaussian prior. Among the top 300 SNPs selected by the z scores for the dominance model, three are significant after adjusting for multiple comparisons (see Table 2). For the additive model, five additional SNPs are significant after multiple comparisons adjustment. These SNPs lie in a region from 91,959,665 kb to 132,180,015 kb on chromosome 9 (LD plots not included due to space limitations). Three of the eight SNPs are in the region reported in Plenge et al. (rs1953126, rs2900180, and rs942152), and two of them are in LD (rs1953126 and rs2900180). One of these SNPs, rs1953126, was reported in a study of 475 Caucasian patients  to be significantly associated with rheumatoid arthritis (odds ratio 1.28, CI 1.16-1.40, trend p-value = 1.45 × 10-6). The other five SNPs are not in the candidate region and are not in LD with SNPs in the region. The significance of other SNPs deserves further investigation in an independent sample. An alternative one-step approach would be reporting permutation p-values of Bayesian logistic regression with all SNPs on the whole sample. However, it is well known that increasing number of predictors, and therefore the number of parameters, in a multivariate analysis may reduce power. The two-step approach provides a balance between the need to reduce multiple comparisons and the loss of power due to increasing number of parameters. We only analyzed SNPs with no missing data due to the incapability of handling missing covariates data of the BBRBMR software. One solution is to first impute the missing genotypes and then run the Bayesian regression on the imputed data. An alternative is to handle missing data directly in a Bayesian analysis by data augmentation. Here the priors are assumed to be independent and their variances are assumed to be the same. We choose prior variance by cross-validation. An alternative strategy would be specifying a hyper-prior distribution (such as non-informative prior). To incorporate prior knowledge such as physical distance between the SNPs, one can specify prior distribution to have distance-based correlation. How to specify such a correlation for a large scale regression is worth further attention. Large scale Bayesian logistic regression is useful to analyze genome wide case-control data with large number of SNPs. Coefficient estimates or z scores from such regression can be used to select important SNPs for further genetic analysis. Such procedure reduces number of tests performed and alleviates problem of multiple comparisons. The Genetic Analysis Workshops are supported by NIH grant R01 GM031575 from the National Institute of General Medical Sciences. YW (PI) and YF (subcontract PI) are supported by NIH grant AG031113-01A2. This article has been published as part of BMC Proceedings Volume 3 Supplement 7, 2009: Genetic Analysis Workshop 16. The full contents of the supplement are available online at http://0-www.biomedcentral.com.brum.beds.ac.uk/1753-6561/3?issue=S7. YW designed the study, performed the statistical analysis, and drafted the manuscript. NS performed the statistical analysis. YF participated in the study design and helped to draft the mansucript. All authors read and approved the final manuscript.